In the sideshow, snakes are, and always have been, a staple in the lineup. 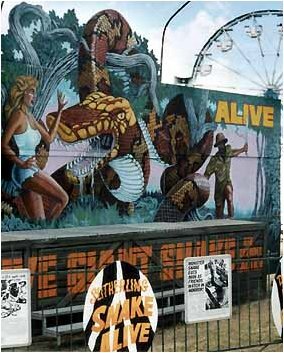 As you first fall under the spell of the sideshow arts, your very first taste of peculiarity is usually the sight of a lovely bally beauty in intimate contact with the slithering scary scaly sinuous serpent of your nightmares. The fascination often stems from a fear of snakes. Many otherwise rational people have an inexplicable built in revulsion and abhorrence of the snake. This may be cultural. Or instinctive. To see an attractive scantily clad female wrapped in the horrifying embrace of the serpent is both fascinating and revolting at once. The hypnotic effect created by this sensory confusion is useful to the bally arts where the objective is to stop and hold a crowd. This same effect is responsible for the snake’s obligatory presence in the menagerie show. In the traditional pit of snakes type show, the captivated crowd standing around the pit, actually ballys for the attraction, drawing more patrons. The crowd of spectators, mesmerized and gazing into the pit of snakes, attracts the attention and piques the curiosity of midway bystanders, resulting in more fuel for the engine. These become the next ones spellbound at the snake pit, and trap more as the cycle continues to grind away. In the wild, snakes try to blend in and become invisible, in order to trap a meal. The midway snake show works in a remarkably similar fashion. Passersby become curious and end up enchanted by the serpent. Snakes live in a silent, blurry world of shadows and light. Fido, the dope sniffing dog, can only envy, but never achieve, the snake’s remarkably well developed and ultra sensitive sense of smell. They capture their prey by following an airborne scent trail. Their forked tongue darts in and out to taste the air, and works kind of like binocular vision, or stereo hearing, allowing them to discern direction and distance. The trigger that causes them to strike is the carbon dioxide in the exhaled breath of its prey. They identify and relate to all other living creatures based on these olfactory signatures, much as we rely on vision, hearing, and computers. When handling a large snake of unknown temperament, don’t exhale. They always strike the face. And wrap the victim in their coils immediately. With unexpected swiftness. Reptiles are a paragon of efficiency. Without the ability or the need to maintain body temperature, they burn very few calories. The giant jungle pythons seldom move. They claim a territory in the wild that is about the size of an average apartment. If a big snake is on the move, it’s because something is wrong, too hot, too cold, or the game trails have changed. Watching a snake eat is a lesson in alien behavior. They waste remarkably little. They eat their prey completely, swallowing it whole. They also kill quite efficiently. They strike with lightning speed. The constrictors are amazingly powerful. They take down strong animals that are fighting for their lives. They do it with bodily strength. They squeeze the breath out of them, then they crush their bones. They use their entire bodies the way we use our hands. When a snake swallows its dinner, the very act of eating is a workout. A snake’s jaw unhinges, and this allows the throat to stretch and expand to swallow an animal much larger than the snake’s body. You can see the lump move down inside the expanding belly. They are the swallowing champions of nature. Some of the venomous species can spit venom with amazing accuracy, blinding and disabling its adversary or its prey. Pythons mature to tremendous size, they never stop growing. Reptiles grow till the day they die. The limitation is food supply and appetite. As a young man in the circus, I had the good fortune to learn a few secrets from the best animal experts. I once worked a season with jungle cat trainer Pat Anthony. He had a wild animal compound in Riverview Florida. He had beautiful daughters, I was over there a lot. Bill Johnson was his zookeeper. He was known for providing showmen with the largest giant snakes. He cultivated and grew them. He obtained pythons as juveniles, as time went by, he sold off all but the most aggressive hunters with the best appetites. These he gorged with meat. Snakes are by nature, hunters and predators. They eat only what they kill, by instinct. Snakes, when fed live prey, seem to do much better than snakes fed frozen or even recently killed meat. Most healthy snakes won’t eat dead meat. Pat Anthony had lions and tigers. Lots of them. Also meat eaters and predators, they required massive amounts of red meat. This was obtained on the hoof. Poor old retired broken down old nags destined for the glue factory, lived out their last days in a pasture that led to the abattoir. When it was time to butcher cat meat, Bill always cut a few long boneless strips of prime horsemeat. Sixty, maybe eighty pounds a strip. Big around as a man’s leg. Into one end of these giant meat strips he would sew some strings of catgut. This was to tie the huge chunk of meat between the legs of a live chicken. The hungry snake would hit the chicken, swallow it head first, and the horsemeat tied between its legs would go with it. All that protein would soon become more snake. After gorging themselves on massive amounts of raw meat, they find a cozy warm place to take a nice long nap. Like a week or two. During which time they digest and grow. They outgrow their skin and shed it off. All that’s left is an empty snake. They move on completely reupholstered. And very hungry. 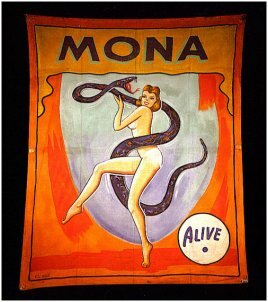 As a performer I have often envied the sideshow snake’s good fortune in getting to work coiled around gorgeous babes. Until I saw what went on in the Geek Show. The Geek Show is snake hell. The only member of the company with a worse job than the star, the geek, is the co-star, the geek’s snake. Even in the toned down modern Geek Show, Billy Reed, the drug addicted geek, performs an unnatural act with the snake. Not to be prudish, but performing oral snake in public is sick. This should not even be done privately! I’ve heard all this, repeatedly, and can’t prove or disprove any of it. All I know for sure, is that the public really goes big for my snake show. And I’m kind of proud, and quite fond, of ,Killer, my enormous python who is a gentle giant. At this point the band plays, the curtains part, and a living doll wearing live snakeskin and a venomous smile makes a sensational entrance that leaves the audience breathlesssss. “Bally Beauty” Showgirls featured in the free “Bally”performance held on a stage by the entrance to the sideshow for the purpose of enticing spectators to purchase a ticket to the sideshow. “Killer” is a Cambodian jungle python weighing close to three hundred pounds, approaching twenty feet in length, with parts of her body as big around as a tree trunk. She entered show biz at an early age. 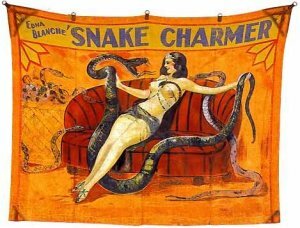 She has performed as a bally snake for the sideshow, a photo snake at the circus, and most recently, a featured attraction in her own show with her name on the marquee. Untold thousands have marveled at her massive magnitude, elegant grace, and immense beauty. Those who have seen her hunt and eat have been awestruck by her majestic strength.